One of the biggest perks of being located in downtown Manhattan is being able to start and end each day with a gaze up at the magnificent One World Trade building. 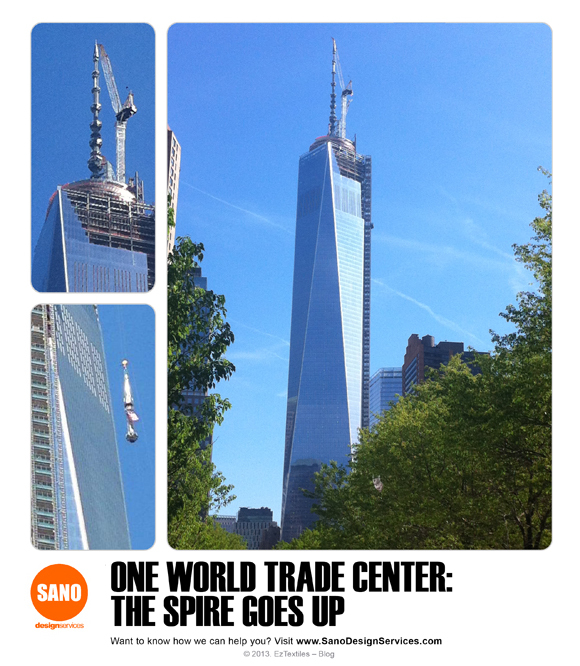 We were lucky enough to watch the culmination of the construction process; the raising of the spire! Bringing the total height to 1,776 ft. (a nod to our Declaration of Independence) it’s now the tallest building in the western hemisphere, and our humble studio is only yards away! Help us give a round of applause to all the time and energy (not to mention $$$!) that has gone into this triumphant return of the downtown NYC skyline. This entry was posted on Friday, May 10th, 2013 at 2:39 pm	and is filed under Sano Design Services, World News. You can follow any comments to this entry through the RSS 2.0 feed. You can leave a comment, or trackback from your own site.